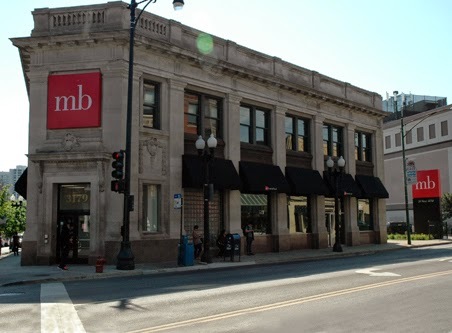 MB Bank, Clark and Belmont. Three robberies headline the weekend so far. • Passers-by reported a man in his early 20's on the ground, in pain, and bleeding from the head at Brompton and Pine Grove early Saturday morning. Paramedics located the man and police soon determined that he had also been robbed at gunpoint of $20 and an iPhone. Officers issued a flash message describing the offender as male, black, 6'3" tall, with shoulder-length dreadlocks. He was armed with a small black handgun. CPD case HX435653. • Over by Illinois Masonic Medical Center a resident of the 2900 block of Mildred calls 911 after seeing two men "approach" their neighbor on the street round 4AM today. Minutes later, the neighbor calls 911 and says two strangers came up to him, demanded his watch, punched him in the face, and fled the scene. Case number TBD. • Just before 5AM today, a witness reports a man standing at an ATM surrounded by six to seven offenders who are demanding money. Officers find the victim at MB Bank on the corner of Clark and Belmont. Case number TBD. Wednesday, 10:34PM - Officers working the Cubs game in Wrigleyville report a man has been slashed with a razor outside of Slugger's sports bar at Clark and Eddy. Police search for the suspect, described as male, black, wearing a black jacket, a black backpack, a baseball cap, and possibly named "Ted." No luck. Meanwhile, the victim is taken to Illinois Masonic Medical Center for treatment. Recorded as an aggravated battery with a cutting instrument in case HX432673. 5:19PM - Center on Halsted staff has detained a phone thief. Case HX435032. 7:47PM - A resident in the 3300 block of Clifton arrives home to find his house burglarized. 8:05PM - A Giordano's pizza delivery guy leaves his car unlocked at the restaurant in the 1000 block of Belmont. When he returns, he finds his backpack, checkbook, and silver laptop compeer are gone. 1:22AM - One arrest for battery at the Wrigleyville McDonald's. 1:40AM - Officers responding to a disturbance at Halsted and Aldine run a man's ID for wants and warrants. He has none, however he is on federal probation after pleading guilty to distributing more than 5 kilos of cocaine. 2:46AM - Burglary reported at an apartment in the 900 block of Addison. The offender took the victim's keys. And his car. 3:16AM - 20 people fighting in the street at 1020 Belmont. 4:11AM - An employee at Dunkin' Donuts, Clark and Belmont, wants to talk to police because two women just threw Flamin' Hot Cheetos in her face. 4:26AM - One wild woman is arrested under the Belmont L tracks. Related to the "20 people fighting" incident. 5:27AM - Two people fighting in front of Subway restaurant at 901 Belmont. 5:28AM - Seven people fighting in front of Subway restaurant at 901 Belmont. They are also harassing People's Gas employees who are trying to investigate a reported leak. 5:54AM - A resident in the 1300 block of Barry hears glass breaking and banging outside. He thinks there's a burglary going on. 6:14AM - Woman says she became the victim of a criminal sexual assault at 905 Belmont. She refuses medical attention and tells officers that she lost her car keys during the incident. They give her a ride home and apparently file a report. 6:43AM - 911 callers report a suspicious man trying to break into cars in the 1000 block of Belmont. He's white, 6-feet tall, has a beard, and is wearing a red shirt and brown shorts. 6:44AM - That man is now passed out. Moments later, he's awake again trying to pickpocket a guy outside of the bagel store at Belmont and Sheffield. He's eventually arrested for crack possession. 8:34AM - Woman calls 911 from the 1300 block of Barry to report that someone has broken into her garage. She lives directly next door to the guy we mentioned at 5:54AM. 4:40PM - A retired police officer needs help getting his stolen computer back from two offenders who are inside the Merlo Library, 644 Belmont. Two arrests. 7:55PM - Resident discovers that they've become Lake View's newest burglary victim. 3500 block of Greenview.